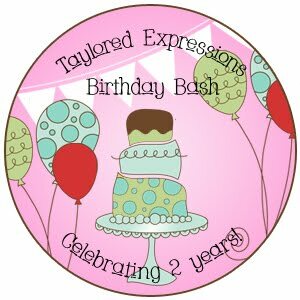 Today I'm honored to join in on the Taylored Expressions 2nd Birthday Bash. All of the new stamps and products you've seen previewed this week from the Baker's Dozen are now available at the TE Store! 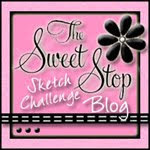 If you came here from the fabulous Debbie Olson's blog, you're right on track with the hop! If you want to start from the beginning then head over to Taylor's blog. Speaking of the fabulous Debbie Olson, I CASE'd the layout from this pretty fall card of hers for my project today. The adorable TE stamp set I'm showing you is called Shooting Stars. The sheep is stamped in Memento tuxedo black, colored with Copics, and I added some gold Stickles to the star trail. The rolling hills were cut out by hand with a pair of scissors. I made the "moon" (it's supposed to look like a moon anyway, lol!) using two different sized oval Nestabilities and popped it up on foam tape. ....here's the inside of the card that shows the third stamp in the Shooting Stars set. I LOVE that there's a sentiment to use on the inside. Okay, NEXT up in the hop is the sweet and super talented Sharon Harnist! I LOVE your moon, Denise -- fabulous idea! And adorable card -- love it! I love your moon too and how you incorporated the sentiment on it! Your sheep is soooo cute! I love the rolling hills...fantastic job as always!!! Oh...that is just too cute! Love your moon! Ahhhh! This is so precious. Such a sweet card, I love the design and the paper you've used is so adorable. Love all your details - so cute! So wonderful card Denise,I love the image and your papers. Oh how sweet! I love the moon treatment! Too cute! Love the kraft and the moon is just perfect! Wonderful card! What a super CUTE card!! Love that striped DP and all the curves! I love how you cut out the rolling hills, that is a fantastic idea! Love the card, too cute! How is the running? Oh that's just adorable Denise!! The rolling hills and moon are just perfection!! Awww... This little guy is adorable. Oh my...so cute girl! Love your moon! Just adorable! Love all the curves and the soft colour scheme! How adorable! LOVE the crescent moon! This is SO sweet Denise! 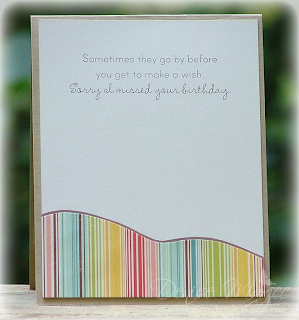 LOVE the rolling hills and the sentiment panel! SO cute Denise...love the shape the the layout, it's sure fun. Yummy patterns too, and that little sheep is so cute! This is perfection, Denise. Such a sweet image. Love the moon and just the right amount of sparkle on the star trail. Love this. This is so adorable, Denise! I love the moon for the sentiment and your image is so fabulously colored! Thanks for helping us celebrate our birthday with a bang! I LOVE, LOVE, LOVE everything about your card!!!!!! GET OUT!! 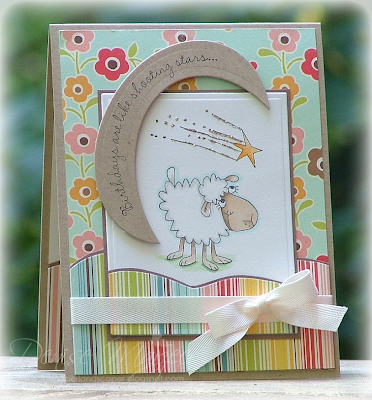 This little sheep-y is SO cute and I LOVE the way you did the DP border! SO fabulous Denise!!! Your sheep coloring is SO cute! LOVE your details!!! OMG! Lovin your moon Denise! You totally pulled that off!! So cute! This is just TOTALLY cute!! Awwwww....totally cute!!! Love your moon and funky panels and of course your colouring is awesome as always!! !